I’m frequently asked if I prefer a certain breed of dog for scent detection. My answer is always the same — no, not really. Breed choices are mostly arbitrary in my opinion and are usually based on the person’s pre-conceived and stereotypical notions about certain breeds of dogs — such as beagles and terriers can find bombs, and Belgian Malinois and German shepherds can find bugs. Sociability — Does the dog exhibit aggression toward, or fear of, other dogs or people when approached? Taking a well-trained dog and someone with dog experience with you when you conduct an evaluation allows you to focus on observing and will make this decision process easier. Anxiety — Does the dog exhibit tension or anxiety in response to noises, other dogs or animals, people or new sights or smells, etc.? Fears and anxiety are difficult for professional trainers to deal with — and even more so for new handlers. Drives — The dog must be high-drive, meaning that there must be something that the dog wants badly enough to work to obtain. That thing is usually a toy or a piece of food. Whatever the reward is, the desire to get it must be strong enough to motivate the dog to work hard and ignore distractions. The two basic drive classifications are briefly discussed below. 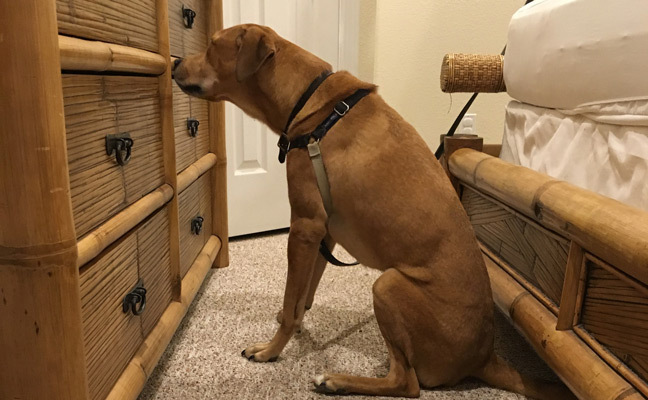 Food drive — If you’re evaluating a dog for “food drive,” you’ll need to determine whether the dog will climb over things, crawl under things, and scramble to find and eat a treat, even in the face of some big distractions. The specifics of testing for food and toy drive will be covered later in this series. Toy drive — Just as with the food-rewarded dog, the toy rewarded dog must be willing to climb, crawl and search diligently to find a concealed toy. If the dog quickly gives up the search, then it would likely do so when the real work begins. Energy — To do this work, a dog must be energetic. If you’d like to know how difficult this work is for a dog, get on your hands and knees and sniff rapidly for about five minutes while crawling around on the floor. Then think about the dog doing that for four to six hours every day. Dogs that are too laidback don’t typically do well in scent detection. They make great pets for someone who likes that kind of personality, so don’t be too sad for the dogs you don’t take. Age — We like to start dogs that are at least around eight to 10 months old, and no more than two years old. Many younger dogs tend to have a problem focusing on the intense training exercises that are necessary for this work, and people are reluctant to invest in a dog that is much over two years old.